NOTE (October 2016): The location of Soei has changed. Please see updated details below. There are countless outstanding restaurants in Bangkok, but I kid you not, when I say Soei (ร้านเส่ย) is one of the absolute BEST restaurants I’ve ever eaten at in the city (if not the world). Soei (ร้านเส่ย) serves food that’s so intensely flavorful, it will not only make your tongue tingle with delight, but your entire body will convulse with joy after every bite you take. Ok, that might be an exaggeration, but really the food at Soei (ร้านเส่ย) is truly one of my favorite restaurants in Bangkok. I eat at Soei quite frequently, so this blog post does not just include a single meal, but I’ll continue to update it with more dishes. The food is unbelievably flavorful. The restaurant is located right at Sam Sen Railroad station, which is located in the quiet and peaceful Dusit district of Bangkok (not too far from Victory Monument). It’s in the same area as Ratchawat Market and Sriyan Market, two more of my favorite places in Bangkok for delicious food. 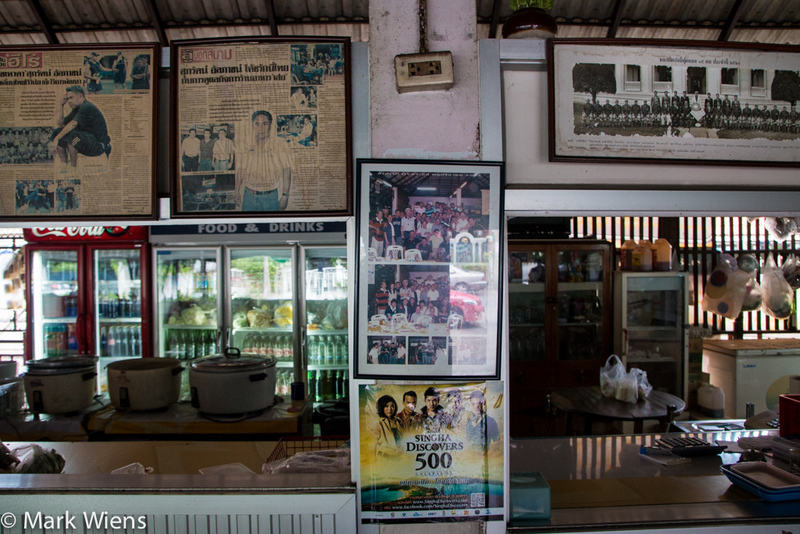 As soon as you enter Soei (ร้านเส่ย), you’ll see all the plaques, trophies, and photographs hanging around the kitchen. Look a little closer, and most of them are photos of sports teams. P’Soei, the owner and chef of the restaurant, was a former rugby, basketball, and football player, and he was even a coach for a period of time. “He has always had a passion for sports and food,” his nephew told me. When P’Soei, was playing rugby, after games and practices all his teammates would come over, have some drinks and P’Soei would cook up some ferociously flavorful food for them all to enjoy. This was the beginning of his restaurant. Another impressive thing about Soei is that P’Soei is the only cook – every dish that’s served at the restaurant passes though his hands, making the quality and consistency of the flavor impeccable. Sure he has a few sous chefs who do prep work, but he is the only one who actually cooks and assembles every dish that is ordered. The last time I went, during a midday early lunch, there wasn’t much of a wait, but his nephew (who is the manager of the restaurant) told us that sometimes, probably especially on the weekends or holidays, you might have to wait 2 – 3 hours to get your food (since there’s only one chef) or even to sit down. Sometimes there’s a waiter who stands outside the restaurant with a sign that mentions how long the food wait will take. 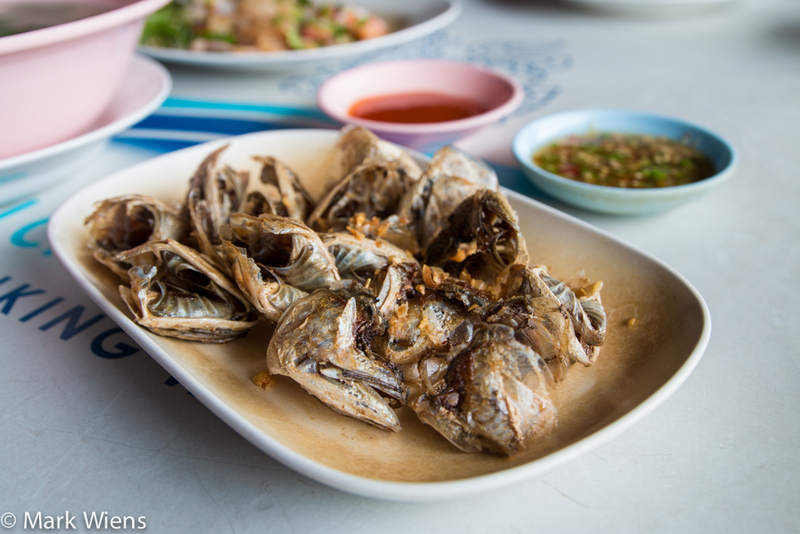 Kaem pla too tod (แก้มปลาทูทอด), or Indian mackerel cheeks (but really they’re more like whole faces), is not a Thai dish you’ll find at too many restaurants in Bangkok. In fact, it’s something I’ve only seen so far at Soei. They are so popular at Soei that you have to call ahead (phone number below), in the morning before you eat there, to reserve however many plates of mackerel fish cheeks you want. Ying and I ordered a plate in the morning before going for lunch. 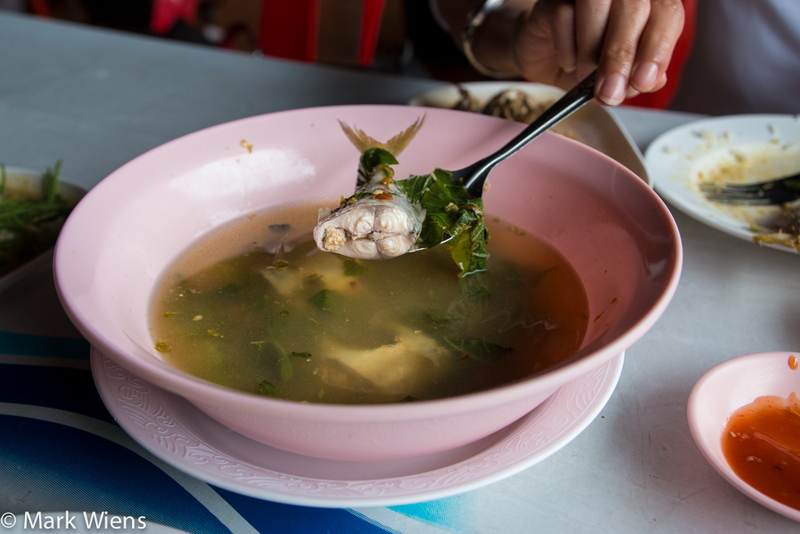 The kaem pla too (แก้มปลาทู) were detached from the body of the fish, but somehow they were able to grab just the outer layer of the face. They were seasoned with little more than deep fried crispy garlic and a pinch of salt, deep fried to a crisp, and then served with chili sauce. Not only was it cool to munch on an entire mackerel fish face, but it was incredibly tasty. They were like fish crackers, crispy all the way through, yet nice and light and fresh, with a lovely garlicky flavor. 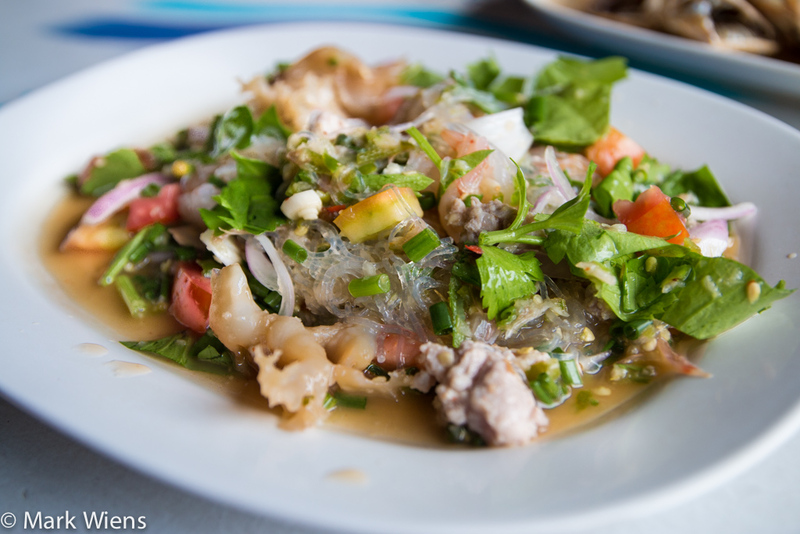 Goong chae nam pla (กุ้งแช่น้ำปลา) is a Thai seafood dish, sort of the Thai version of ceviche. Normally just a selection of raw shrimp are marinated in lime juice and chilies and raw garlic; It’s a dish I absolutely love eating. At Soei (ร้านเส่ย) they take the extra step and load up their goong chae nam pla (กุ้งแช่น้ำปลา) with wasabi; It’s like a Japanese Thai fusion of delicious. The sauce was basically a harsh combination of wasabi, lime juice, crushed chilies, and raw garlic. The shrimp were raw, but perhaps cooked just a tiny bit from the acid of the lime juice and wasabi. You first take a spoon of wasabi drenched shrimp, garnish it with a sprinkle of fried shallots (served in a small bowl on the side), and finally garnish your bites of the green herb, known in Thai as krateen. It was sensational – the wasabi burned all the way through my nose and the heat lingered. I discovered that I not only got that quick burst of wasabi burn, but the heat lasted from the addition of crushed Thai chilies too. Goong chae nam pla (กุ้งแช่น้ำปลา) is not for someone who doesn’t enjoy overly strong flavors, but if you do, like I do, you’re going to love it. 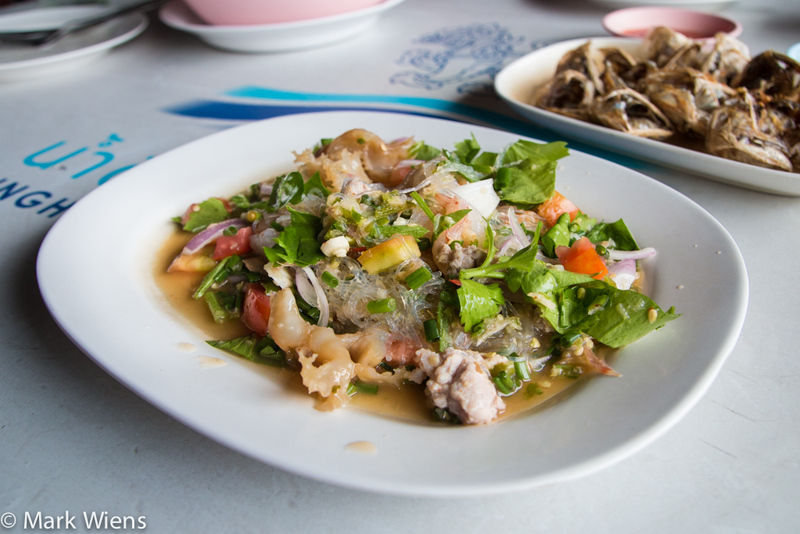 One of Ying’s favorite Thai dishes is yam woon sen (ยำวุ้นเส้น), a healthy mixture of mung bean glass noodles, vegetables, and a bit of meat for flavoring. Judging form the strong flavors of all the dishes at Soei, I already knew it was going to be a hit – Ying loves her yam woon sen (ยำวุ้นเส้น) spicy and extremely sour. It was exactly how we had suspected, a great mixture of fresh ingredients, and the dressing was filled with chilies, and sour enough to make you squint your eyes. We both loved it and agreed that it was one of the best yam woon sen’s (ยำวุ้นเส้น) we had ever had at a restaurant in Bangkok. For soup we ordered tom yum pla too (ต้ำยำปลาทู), Thai tom yum soup with mackerel fish. I’m a huge lover of tom yum (the clear version most of the time), I think it’s such a wonderful, healthy blend of herbs and flavors, all wrapped into a delicious soup that goes so well with a spread of other Thai dishes. The tom yum pla too (ต้ำยำปลาทู), was exactly the way I love it. 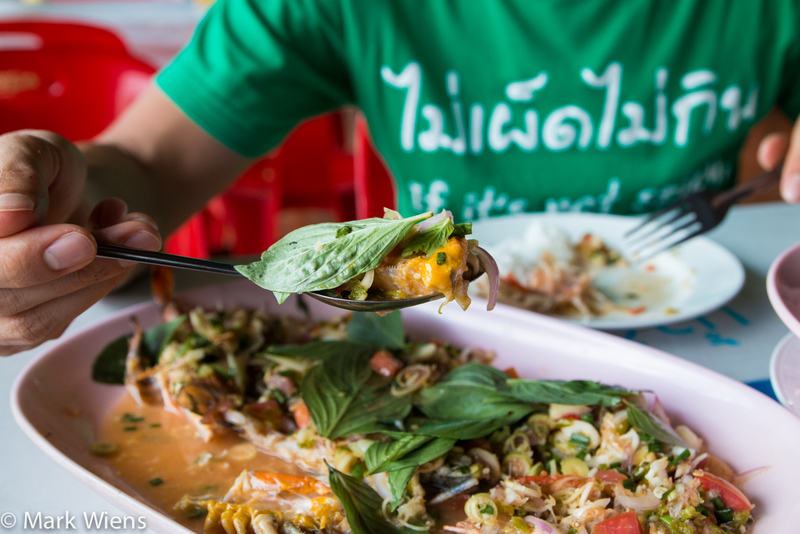 It was ridiculously sour, teeming with chilies, and packed full of fresh kra pao (holy basil) leaves. This was tom yum done the right way, not holding back on the flavors. The restaurant is located in the quiet Dusit area of Bangkok, but while you’re eating, trains will pass by, adding to the ambiance and character of the dining experience. Pla goong pao (พล่ากุ้งเผา) is a Thai shrimp salad, but normally I’ve had it at restaurants, and it’s a little plate of shrimp in a dressing of roasted chili sauce and garnished with a few herbs and garlic. The version at Soei (ร้านเส่ย) was truly an epic creation, both to look at, and the way it tasted. 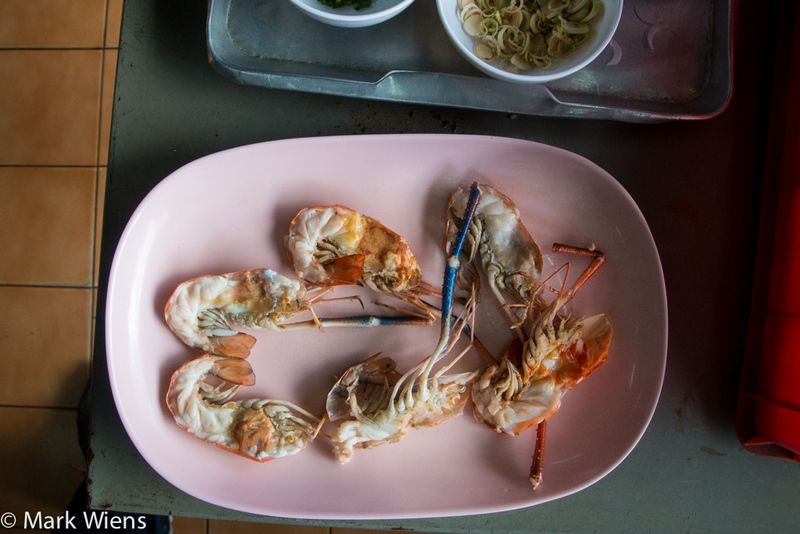 To make pla goong pao (พล่ากุ้งเผา) they first took jumbo freshwater prawns, and grilled them, before slicing them in half. Can you see all those marvelous shrimp head oils that look like butter and mustard!? Just admire that bounty of flavorful ingredients! 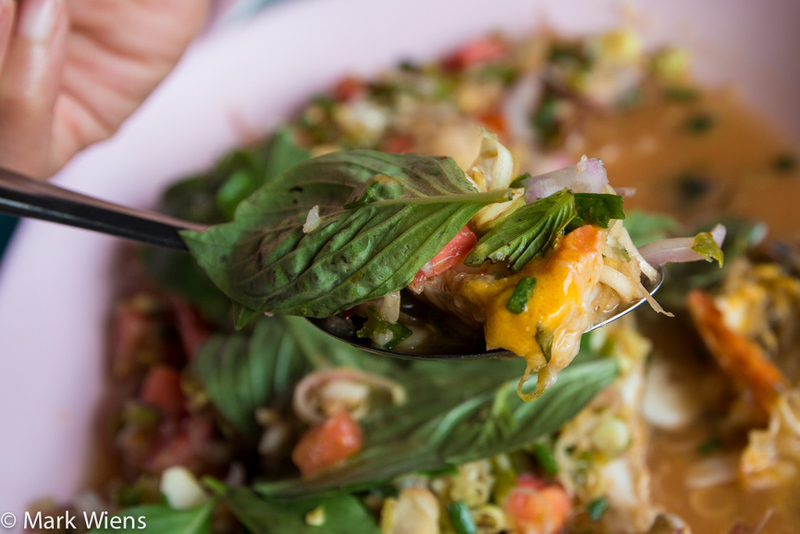 Next, a bounty of fresh ingredients like finely shaved lemongrass, raw garlic, tomatoes, chilies, green onions, shallots, and finally some leaves of Thai sweet basil were thrown on top. The dressing was again, a seriously flavorful combination of lime juice, sugar, and fish sauce. 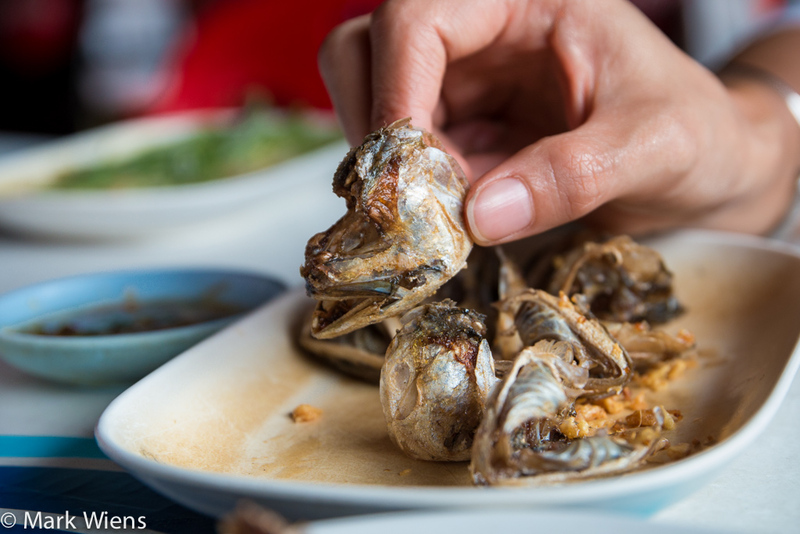 In order to eat the pla goong pao (พล่ากุ้งเผา), it’s easiest to take one of the shrimp, and kind of slide your spoon on the shell to take it out of the shell, making sure you get all that orange yellow head oil on your bite (DO NOT miss the shrimp head oil). After separating my shrimp from its shell, I then found it necessary to re-dip in the dressing and make sure my spoon contained all the ingredients. 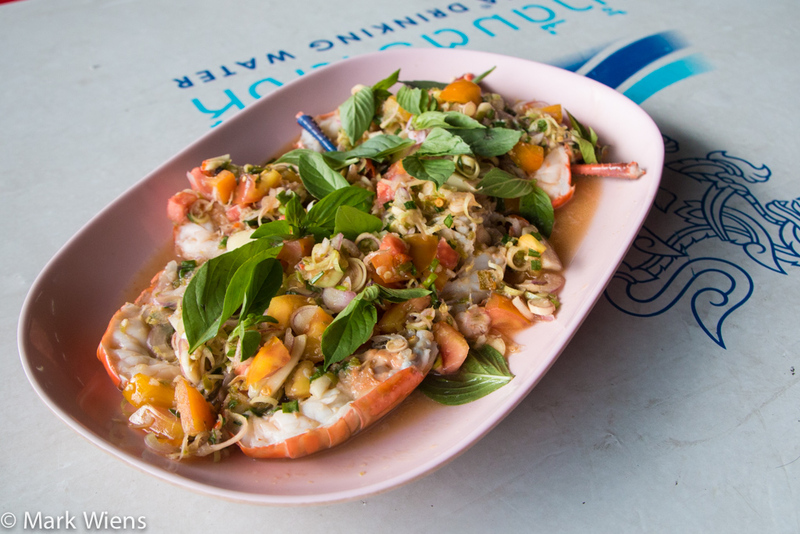 A bite of the shrimp topped with lemongrass, chilies, garlic, shallots, tomatoes, and sweet basil, was almost too good to be true. Every bite, I literally could not contain my overjoy. My heart rejoiced and jumped up and down. Finally, to balance out the salads and other dishes, we ordered chu chee pla too (ฉู่ฉี่ปลาทู), a coconut milk based curry with mackerel fish again. I guess we, without even realizing it, ordered quite a bit of mackerel, a fish I think is amazing. The mackerel was first deep fried, so it was nice and crispy. It was then covered in thick layer of curry sauce, which I think was made only from the top of the coconut milk (hua, in Thai), the heavy cream. The curry was so incredibly rich and creamy, flavored beautifully with turmeric, chilies, and garlic, and then topped with freshly shaved kaffir lime leaves, and a few slices of red onion. It was sweet and spicy, and ultimately rich and coconut creamy. Again, another truly marvelous culinary creation from Soei (ร้านเส่ย). Mackerel is one of the ultimate little flavorful fish, and it’s extensively used in Thai cuisine, and glorified at Soei. Most of the mackerel faces / heads are reserved for deep frying to create Soei’s signature appetizer dish (pictured above), but that leaves a lot of mackerel bodies for cooking, and they are equally delicious. 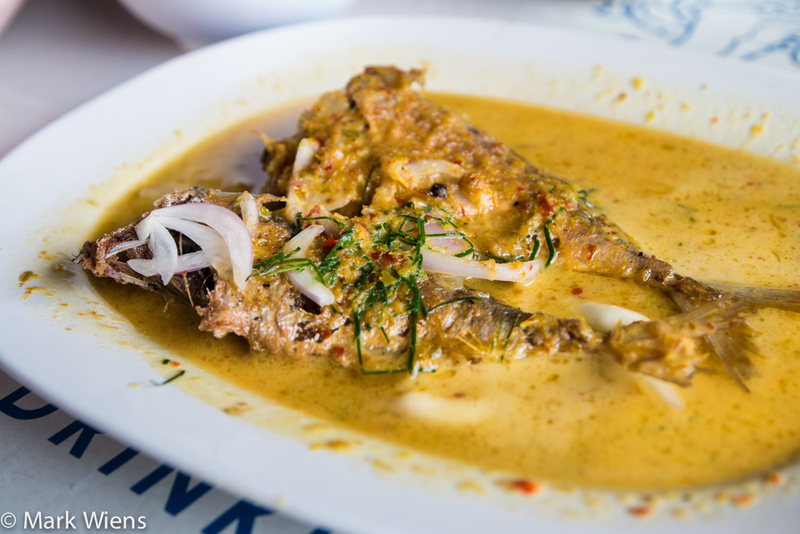 Along with including mackerel in a variety of different Thai curries and soups, another dish they make is pla too tod kratiem (ปลาทูทอดกระเทียม), deep fried mackerel smothered in crispy garlic. 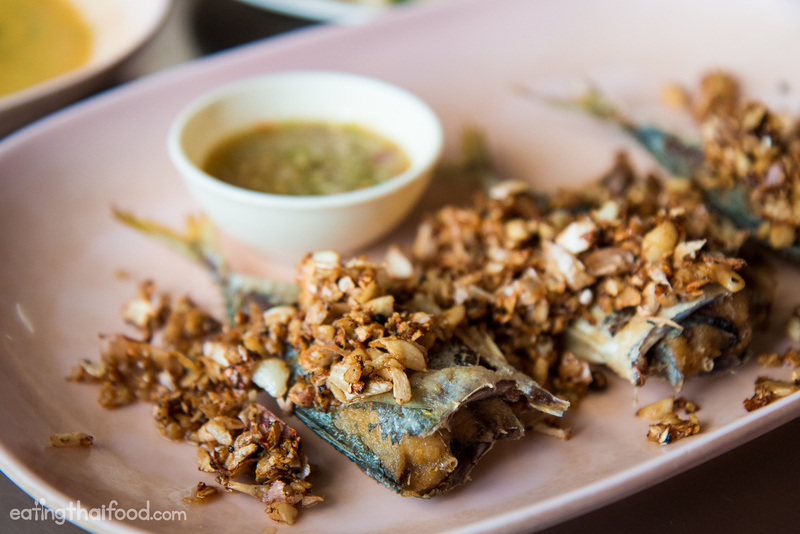 The mackerel were deep fried to a crisp, then topped with loads of sticky and naturally slightly sweet garlic, and finally served with a Thai seafood dipping sauce to ensure ultimate flavor. Simple, yet delicious. You can’t go wrong with that much deep fried garlic. 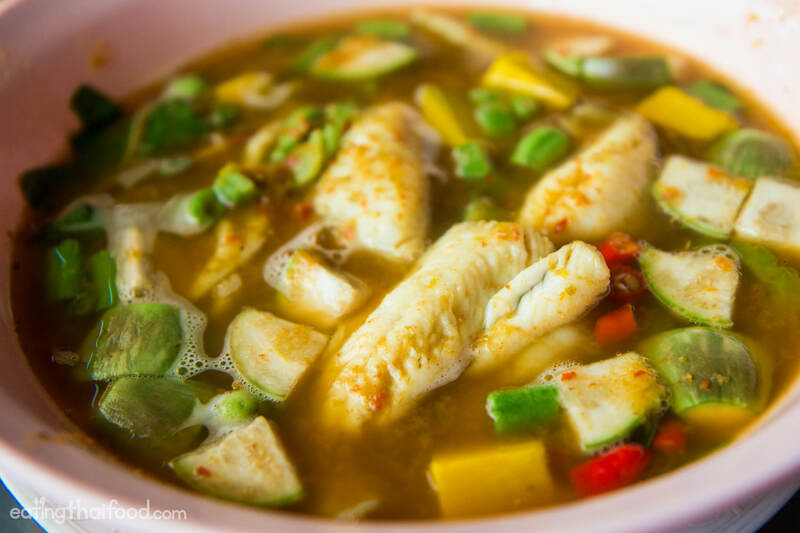 Gaeng pa (แกงป่า) or Thai jungle curry, is one of the traditional styles of Thai curry, packed with curry paste, fish, and vegetables, but with a water base instead of coconut milk. The jungle curry at Soei included a host of vegetables, all just slightly blanched (so they all still remained quite crisp), pieces of boneless fish, chopped fresh red chilies, and a crazy flavorful curry soup. The flavor of the curry, the abundance of chilies, and the slices of bitter melon, all contributed to make it so good. 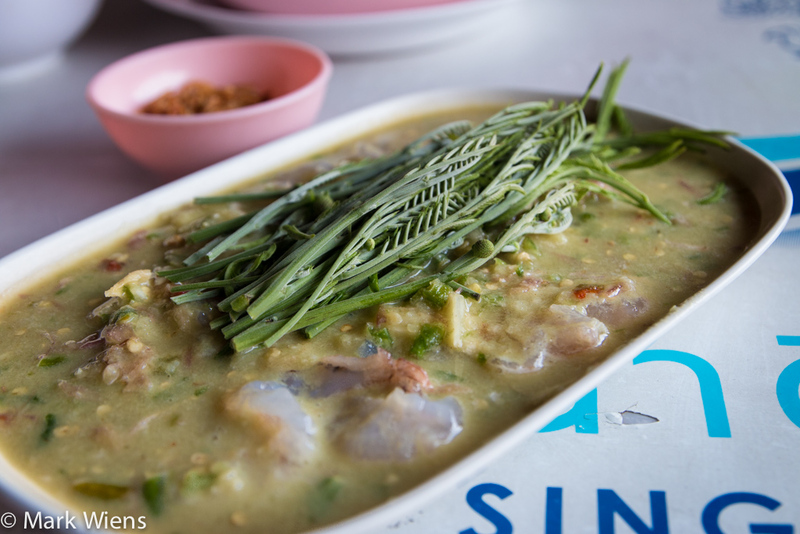 The gaeng pa (แกงป่า) is one of my favorite recent dishes at Soei. 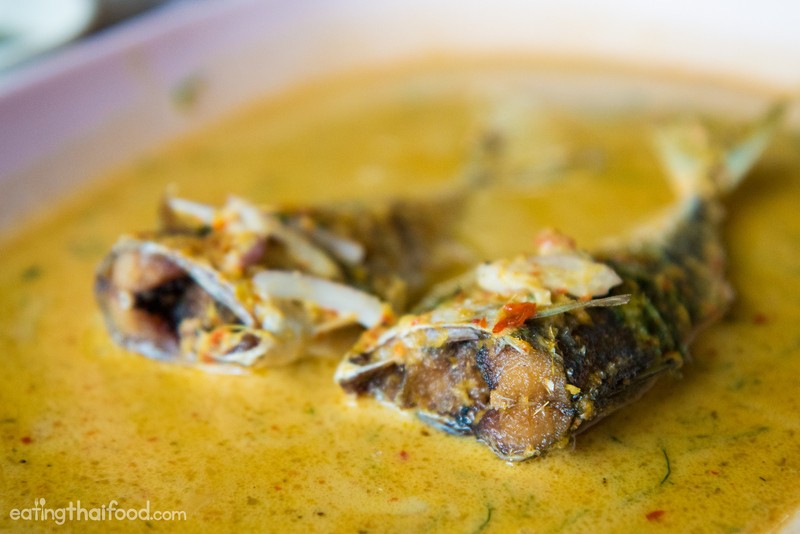 I’m honestly not normally into Thai dishes that are too fatty… or just pure fat (like this!). But the last time I went to Soei, the nephew of P’Soei recommended that I try the kak moo pad ka prao (กากหมูผัดกะเพรา). Kak moo (กากหมู) is basically the leftover, cheap parts of the pig, which usually translates to skin and fat. So this dish included deep fried pieces of pig skin and fat, all stir fried up with holy basil, chilies and kaffir limes leaves. 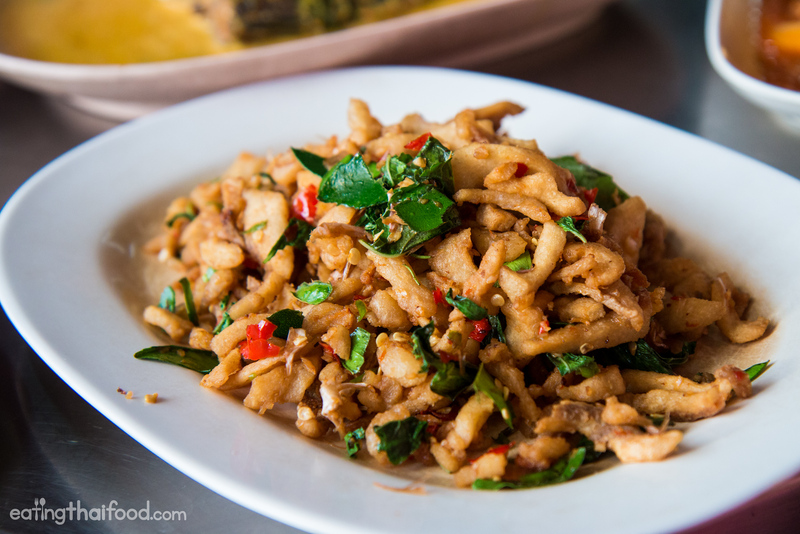 While pad ka prao is normally a saucy stir fry, this was dry fried. The pieces of pork skin were actually quite tasty, perfectly crunchy, with a balance of salty and slightly sweet, and incredibly fragrant chilis, holy basil, and kaffir lime leaves. I probably wouldn’t order this too often, but I will admit it was delicious on this occasion. 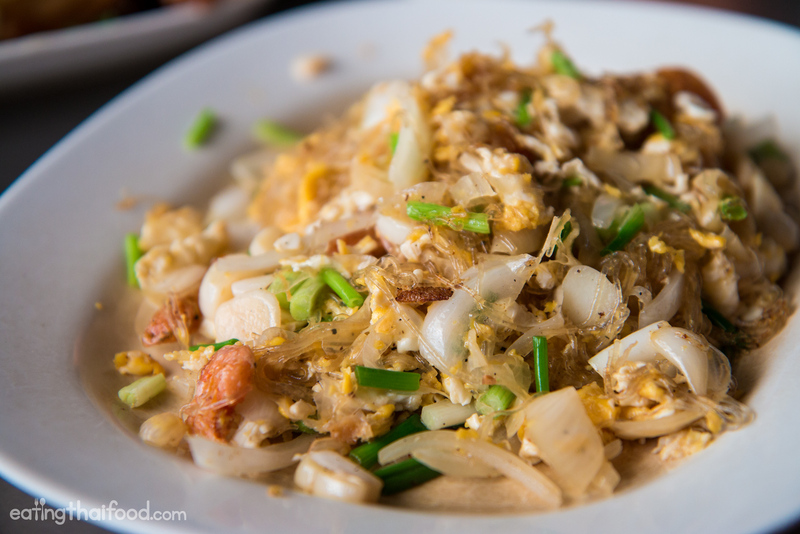 Yam kai dao (ยำไข่ดาว), Thai fried egg salad, is another dish the nephew of the P’Soei recommended I try. And it’s actually a dish that’s not really on the menu, but you just have to know about it to order it. I’ve had a lot of fried egg salads around Thailand, but this one so far tops my list. The eggs were deep fried in what must have been the perfect oil temperature, so the white of the egg turned fully crispy and puffed up, yet the yolk inside remained 100% runny and oozy. The duo of eggs were then topped with raw garlic, chilies, cilantro, shallots, and a dressing that included soy sauce and lime juice. It was crazy good, so good that Dwight and I ordered another plate of yam kai dao (ยำไข่ดาว) for dessert. For something a little more simple and easy on the stomach, you can give the pad woon sen kratiem dong (ผัดวุ้นเส้นกระเทียมดอง) a try. It had a little bit of that sweet and sour pad Thai flavor going on, but it was made with mung bean noodles, and the real kicker that really made it: lots of pickled garlic (kratiem dong กระเทียมดอง). In the stir fried noodles, there were also onions, green onions, dry shrimp, and an egg for good measure. 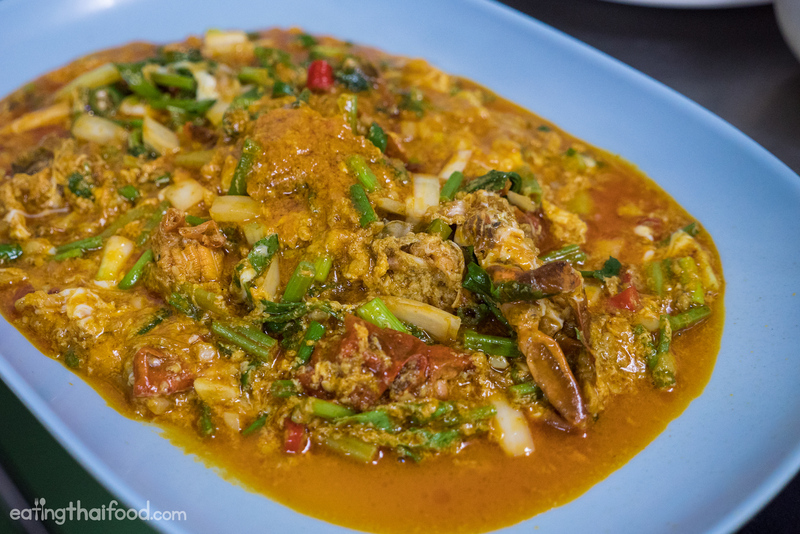 One of my favorite dishes to order these days at Soei is soft shell crab curry (ปูนิ่มผัดผงกะหรี่ boo neem pad pongari). 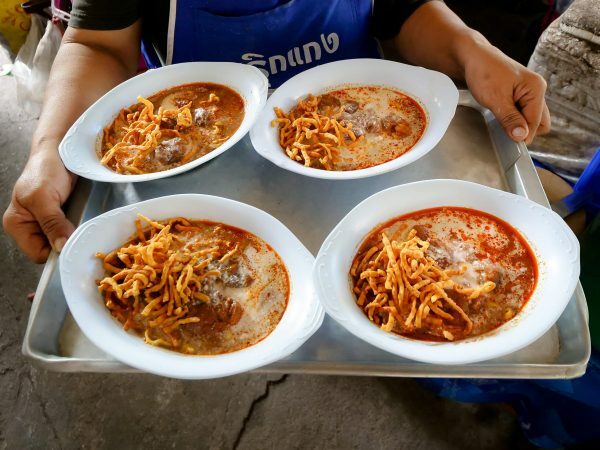 He makes it unlike any other version I’ve had in Thailand – less sweet and more spicy, with a wonderful tone of yellow powder that you can actually taste in each bite. It’s a spectacular dish. 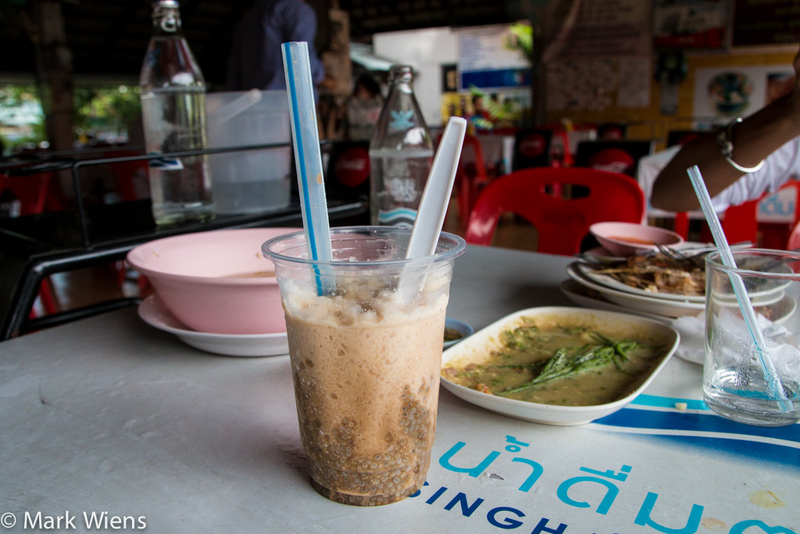 Ow-tung (โอวทึ้ง) is one of the popular dessert options that many who eat at Soei (ร้านเส่ย) finish off their meals with. I’m not a big sweets eater, buy my wife was very excited to try it, and to calm her taste buds down with an icy treat. 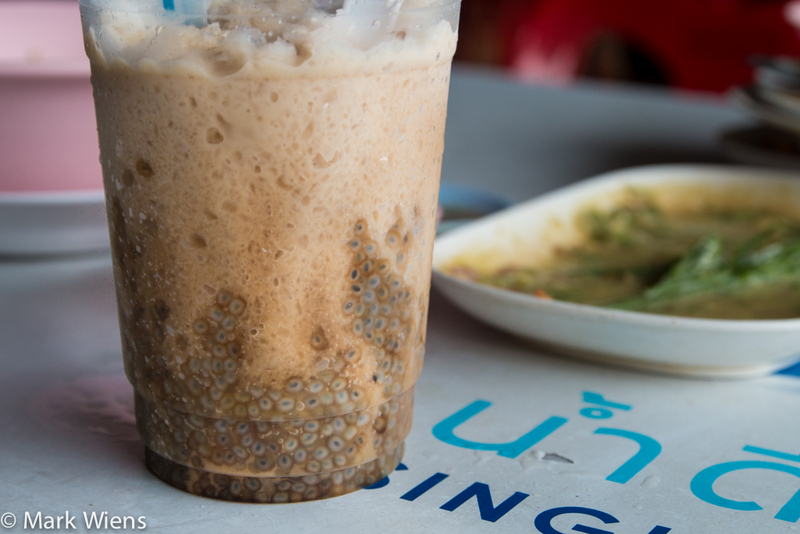 The ow-tung (โอวทึ้ง) was basically a shaved ice creation with basil seeds on the bottom, and flavored with what they said was a mixture of coffee and palm sugar. It almost had a caramel flavor to it, and it sure was refreshing and very good. I only had a couple tastes, but Ying slurped it down pretty quickly, with a full smile on her face. Bangkok is an always changing city. 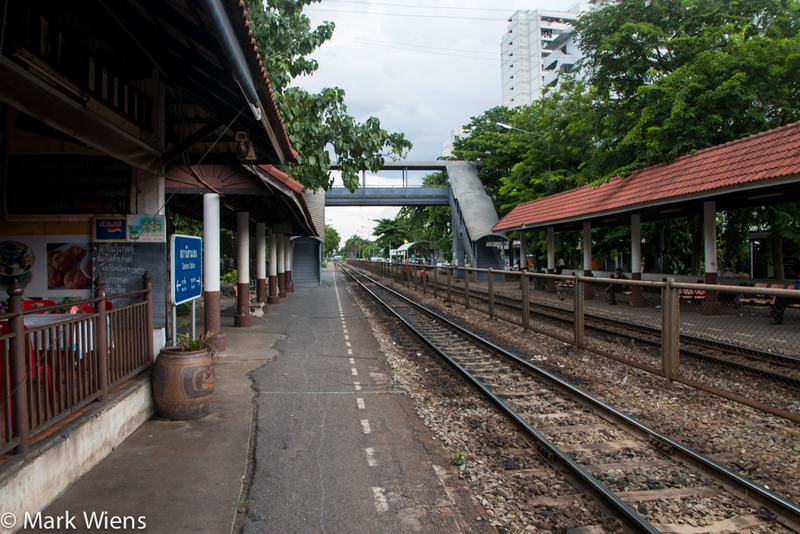 As of October of 2016, Soei Restaurant (ร้านเส่ย) had to move from their legendary location next to the railroad tracks to a house in the neighborhood a short distance away. They had to move due to a BTS station that will be built there. The good new is, the new location is still nice, and they have both open air outdoor seating and indoor AC seating. The kitchen is still outdoors as well. And most of all, I’m happy to report the food is just as spectacular as it has always been! 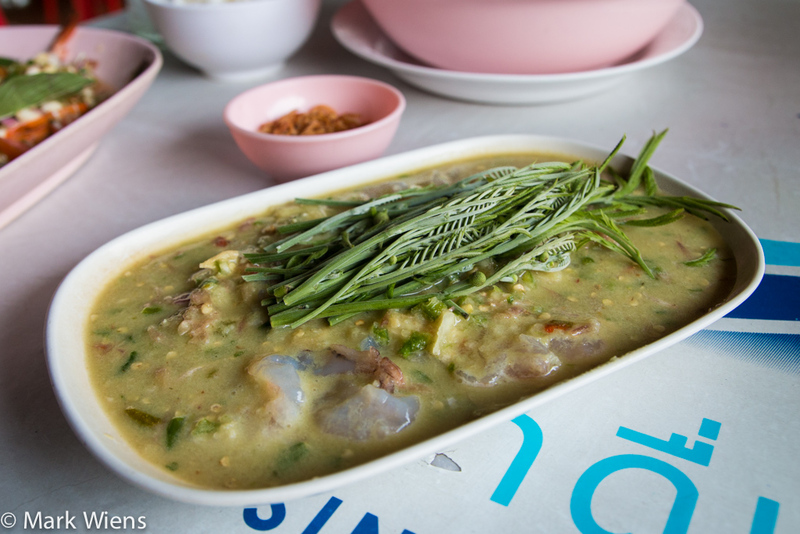 Soei (ร้านเส่ย) is a restaurant in Bangkok that specializes in Thai food that’s ferociously flavorful. The owner and chef of the restaurant was a former sports player and coach, who simply loves to cook and eat. For myself, the food is unbelievably delicious. If you love sour, spicy, herb filled, and just overall, pungent balances of flavors, you should go to Soei Restaurant (ร้านเส่ย) immediately. After eating a meal at Soei Restaurant (ร้านเส่ย) you will be in awe of the intense flavors your mouth experienced. Your tongue will likely be on fire, and tingling with flavor, and your heart will actually be smiling with pure delight. The food is outstanding, and as a lover of extreme flavors, I would say Soei is one of my favorite restaurants in all of Bangkok (and the world). Warning: The food is spicy and intensely flavored, so if you’re not into really spicy food, it may not be the best option for you. NEW Address (October 2016): Located on the corner of Phibun Whattana Yaek 6 and Rama VI Soi 34, Moo Baan Piboon Whattana – Go inside the neighborhood and look on the right hand side before the small roundabout (หมู่บ้านพิบูลย์วัฒนา พระราม 6หมู่ พิบูลย์วัฒนาแยก6 เข้ามาในหมู่บ้านไม่ไกลนัก สังเกตุร้านจะอยู่ด้านขวามือ ก่อนถึงวงเวียน) – Map below is updated. Prices: Soei is not a cheap restaurant, but it’s well worth the prices for the quality and flavor of the food. You could get by on about 200 – 300 THB per person, but the longer you sit there, the more you’ll want to keep eating and drinking (actually it’s impossible to not keep on eating because the food is so good), so you might wind up spending around 500 THB per person with drinks. 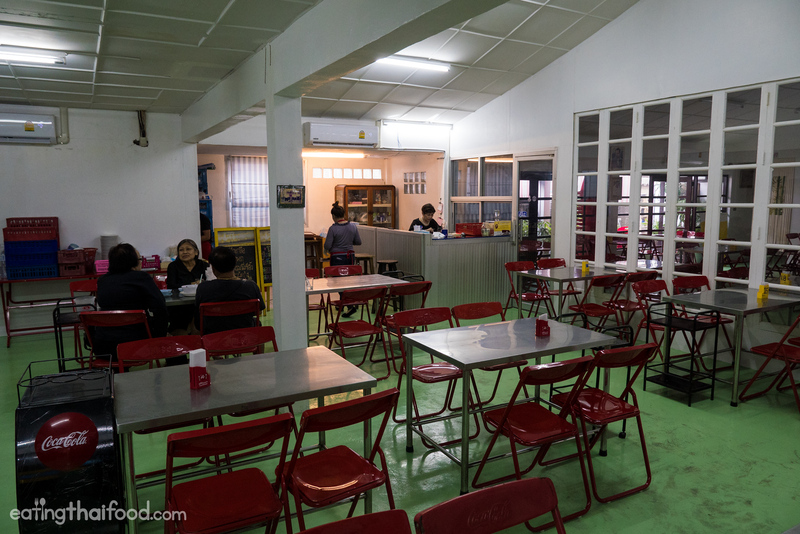 As of October 2016, Soei Restaurant (ร้านเส่ย) has moved to a new location not too far from the original location, but within the neighborhood a little bit. 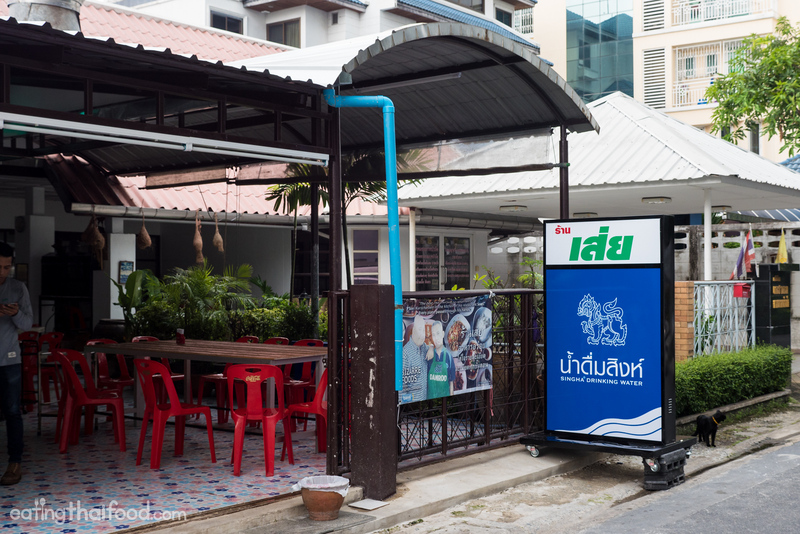 The restaurant is within Moo Baan Piboon Whattana neighborhood, near the corner of Phibun Whattana Yaek 6 and Rama VI Soi 34. See map below for details, or check this map. 136 comments. I'd love to hear from you! Happy Lunar New Year ! I just ate at Soei . This is actually my 2nd time here . First time several years back , after reading your blog , when they were still at the train station . The taste is really flat this round , and I took a peek into their kitchen. Unlike before , unfortunately, I think the chief chef has outsourced his cooking to others now . Thought should update you , as food has definitely dropped in standard now . My wife and I went to Soei some time around May thinking this would be a ‘slam dunk’. After watching your vlog with Andrew Zimmern, we expected an exceptional feast of flavor, but what we got was an ‘okay’ meal. Most notably the ‘Poo Pad Pong Kari’ was not very pronounced in its flavors. 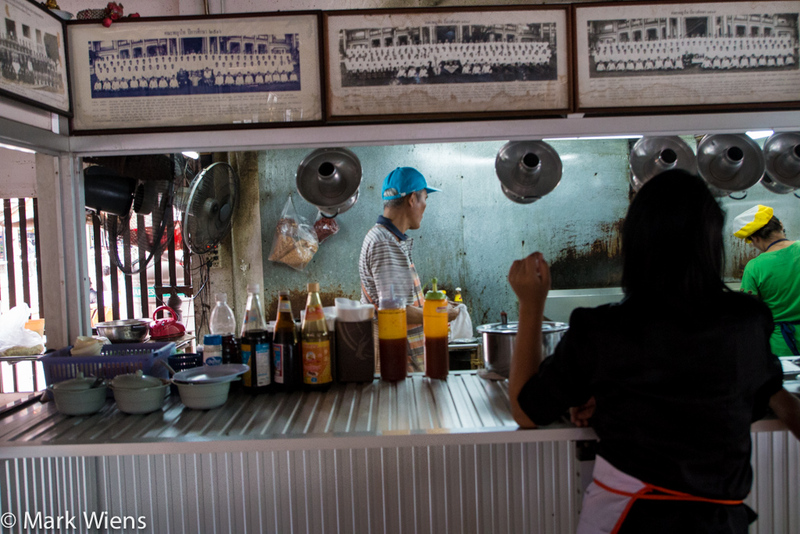 Although we left the restaurant full and satisfied, we were far from reaching the kind of food ecstasy that we’ve experienced in other – equally modest – places around Thailand. Hey Jesper, thanks for the comment and feedback. It’s been a while since I’ve been there, but I do know the main chef P’Soei is not there all the time anymore, so it might not be as consistent. Im Jerome from Sarawak, Malaysia. I have been watching your videos for the past 2 years and always been loving all of it! I finally have a chance to visit Thailand for the first time (Bangkok & Pattaya) after years of wanting to. Your videos are the main reason for my visits to be honest! Cant wait to try all the food that you have been featuring. I am worried about the potential language barrier that I might face, any advice on that Mark? Thanks and hope to bump into you in September! Maybe I went on an off night, or maybe fame and popularity has deteriorated the quality of dishes here–but I must admit that this restaurant was supremely disappointing. Mark provides us all with countless great suggestions, and I had high hopes for this place but ultimately the food here was bland, extremely overpriced, and took 1.5 hrs to arrive to our table. I dined here with a friend of mine who is a local, and we were pretty hungry and excited when we showed up. We ordered 7 dishes, the only memorable one being goong chae nam pla (which was awesome), amd the yam khao dao (only because of that magical egg; it otherwise didnt have much in the way of flavor). The gaeng pa, tom yam pla, and pla tot kratiem were the biggest disappointments. The tom yam tasted more like an overly-lime juiced version of tom saeb (which i normally love), and the gaeng pa was totally bland. Neither were spicy. The pla tot was dry and overcooked (a waste of a good fresh fish). For this price… we could have gone to a fine dining restaurant like the local (which was amazing, by the way). Bummer. Cant win em all I guess! Nevertheless mark, keep doing what you do, as I love your food blog. Cheers! I was so excited to read this review (since I live around the corner) and so disappointed to actually eat it. I thought maybe it was just me so I went back again tonight, and it was even worse. It took 1hr 17 mins for the first of our dishes to arrive, and this was at 5pm on a Sunday night. Service went beyond indifferent and well into rude. The last dish to arrive was khao pad (fried rice) which took 1hr 30m. Honestly – the food was ok, but nothing special. I could name 3 just as good within a 1km radius, but without the terrible service and long delay. Thanks for a great place Mark. Despite a big breakfast, we couldn’t stop eating. Too bad we they were out of mackerel heads. We ate at The Local the night before, we did enjoy the food and the drinks but were not as impressed as with Soei. Will definitely be back on my next trip to Bangkok. Hi Mark! I am going to Thailand soon and your blog and vlog help a lot in finding good eating places. I would like to visit this restaurant. Do I need to reserve a table? Hi Mark! Love all your videos and blogposts. My boyfriend does your eye roll now everytime he eats something delicious haha. We’re going bangkok next year April during the songkran festival. Do you think this place will open during their new year’s? In short, I would say this is not the place to introduce someone first time to Thai (spicy) food. This place has some very specific ‘quirks’ that probably you like, but not representative for many others. Perhaps to keep in mind when you make this recommendation? Hey Mark, I am an avid follower of your vlog and so when I went to Bangkok this time I had to go to Soei. We were a group of 7 and ordered most of the dishes in this blog and then some more. I must say we were completely blown away with every dish, each more flavourful than the other. The waitress asked us if we preferred our chillies separately, but we didn’t want to mess up the chef’s proportions and I was sure our Indian palates could handle it. She also informed us that it would take a while for the food to arrive and it sure did take an hour before the first dish arrived. Now some of my friends were what I would call pseudo meat eaters who prefer chicken or not so strong fishy flavours (as most Indians do) but boy, did we devour every dish that turned up … mackerel heads et al. We ended up having 15+ dishes over 3 hours ! For dinner we went to another well reviewed restaurant at Asiatique and ordered the same soft shell crab. It was just further proof how the flavours at Soei truly stand out. Thanks again Mark for your great vlogs, I would love to have a meal with you one day. Cheers from Mumbai ! I have a stupid question, I’m going in 3 weeks!! So excited but scared I won’t be able to order the right dishes. How did you order? Are there pictures? Did you show them on your phone what Mark had? What do you suggest? Hi Mark, We really appreciate your videos they are truely great. Just wanted to share a very recent experience from today at soei, which my family and I visited for the very first time. Something I had really been looking forward to, but the experience was not fantastis in any way at all. The staff were not at all friendly (actually more like rude), the food according to my taste and my Thai family was quite average (absolutely nothing special) – all in all a huge dissapointment. BTW: had quick talk with another foreign couple who also confirmed the staff lacking service DNA. SO I cannot not recomment this place. But maybee others have had better experiences with them. Looking forward to follow you on new food adventures. Hola, I live in Sukhothai but visit Bangkok two or three times a year for just a few days each time. It would be wonderful if there was some way to search on your restaurant reviews by neighborhood. I generally don’t venture too far from whatever hotel I am at because I waste so much time travelling around. I have spent many enjoyable hours with your blog. Thank you. Hi Mark, Thanks for sharing this with us! I am heading to bangkok soon and i would like to ask if Soei Restaurant is known to the locals such that if we were to take tuk tuk/taxi they will know where to bring us to? Or do you happen to know of the nearest station to the new Soei Restaurant. Hey Alice, great to hear from you and I’m so happy to hear that you enjoy Thai food so much and Thai culture. Glad you’ll be coming back to Thailand again this year. 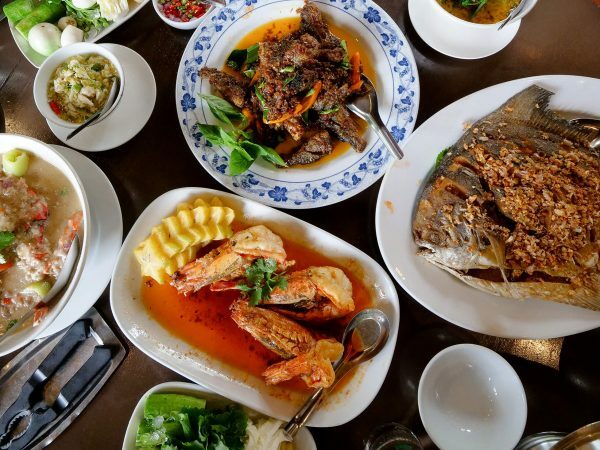 I would recommend this place: https://www.eatingthaifood.com/bangkok-seafood-restaurant-hia-wan-khao-tom-pla/ They serve Thai Chinese rice soup, plus other seafood dishes, with dipping sauce. The seafood is always very fresh and good. Hope you have a great upcoming trip! I have been an avid reader of your blog posts over the last 2 years. So when I had the opportunity to visit Bangkok for a second time, there was no hesitation on which restaurants I HAD to try. After visiting the reclining Budha, I told my girlfriend we had to go to Soei. Unfortunately the Tuk-Tuk drivers wants to rip you off at the popular tourist attractions so we(I) decided we shall walk the +/- 7kms to the restaurant. Haha what a mission, but it was “OH so worth it”. After arriving what felt like the longest, sweatiest walk ever, we sat down to feast. We tried 5 of the dishes you recommended: The mackerel heads, GOONG CHAE NAM PLA (กุ้งแช่น้ำปลา), MACKEREL CURRY, THAI SHRIMP CEVICHE, PLA GOONG PAO (พล่ากุ้งเผา), and lastly the extremely spicy Yam woon sen (ยำวุ้นเส้น). The Yam woon sen had me crying for the entire meal and I loved every second of it. I think the locals enjoyed watching me cry too because I sawseveral people laughing as tears streamed down our cheeks. This restaurant made me so happy, especially after the mission it took to get there. Thanks for a great recommendation and keep doing what you are doing. Hey Drikus, this is one of the greatest comments and stories I’ve ever read, thank you! That is what traveling and eating is all about, as much about the food as the experience. Thank you for sharing, so glad you enjoyed the food! Looks like its close to Chatuchak Market? Is it convenient to just taxi it from there? Kill two birds with one one stone after shopping :) Can’t wait to eat everything this January when I visit! Hey Khoi, it’s in the general area of Chatuchak so you could definitely combine the two. Thanks! I am a 14 year old foodie from singapore and was delighted to visit this resturant under your recomendation. Came here and found one the best (and most spicest) food in Bangkok. Also went to the Beef and Goat noodles at Ekkamai :-). Thank you Yves, really appreciate it. I’m not sure how long they will be closed for New Years, but I’m guessing they might be closed the first week in Jan, just as a heads up. This looks amazing. I’m returning to Bangkok in May and would love to check it out. Do you know if they have any vegan options? Hey Lisa, thank you very much, and great to hear you’ll be coming back to Bangkok. I don’t think I’ve seen any vegan options, but I’ll look on the menu next time I’m there and see for sure. Your recommendation of this restaurant sounds so good! I have been meaning to go for a while now since leaving close to Bangkok. I am a teacher here in Samut Prakan. You mentioned the restaurant moved. Do you know the best way to get there from MoChit BTS? I am not very familiar with Bangkok. Your help is would be greatly appreciated it. Hi Veronica, unfortunately there’s not really any public transportation option to get there. The best option is to go to Victory Monument and take a taxi from there. But if you’re already at Mo Chit, you might be better off just grabbing a taxi / uber from there. Hope you enjoy! My husband and I visited Soei last night based on your recommendations. We are in Bangkok on vacation from NYC. Omg the food was incredible, full of flavor. Definitely the best Thai food we ever had. I am so happy we went there and did not go to the recommended tourist restaurant by our hotel and tour company. Being from NYC and eating lots of thai food there, we wanted to try authentic thai cuisine to compare. I must say there is no comparison. Soei knocks it out the park. The highlight of our night was meetin the chef and owner who chatted with us for a bit and called us a cab to ensure we got back to our hotel safely. Such a kind man. We were secretly hoping we would see you too ????. Hi Janaki, great to hear from you, and glad you were able to eat at Soei last night and enjoyed it so much. Very cool the chef Soei came to talk with you as well. Would have been great to see you there, I’m due to eat there soon! I really love to watch your youtube video. My mom says your smile is beautiful. Thanks for updating us the information of this restaurant. We are family of 3 from HK will surely go there in late Oct.
Hi Anna, great to hear from you, thank you very much. Say hello to you Mom as well! Hi Mark. The restaurant has moved from the said location to about 1 km away, opposite to the Ministry of Finance.. Went there yesterday. The food was indeed superb. Paid 800 Baht for 6 dishes… The ceviche and stir fried sunflower sprouts were spot-on, as was the fish-face dish (best snack I’ve had this year). Was not crazy about the mackerel soup. Hi Mihai, awesome that you found it. I have just updated the post. Thanks! My boyfriend and I go on a trip every year for our birthday (we have the same birthday) and we’ve decided Thailand will be our next destination. We are both passionate about food ( just like you ) and always want to experience how locals live and most importantly, eat. Now, I’ve read your blog thoroughly and know where to eat the best street foods and such, but it would be such a different feel to have a real authentic Thai meal at a local home, cooked by local family. Do you have any suggestions where I can find that? We’ve done that at a few different countries and loved getting to know local stories and enjoying their family traditions. On a different note, I’d like to share something with you. We were in Morocco one time, and went on a food tour with this couple. Wife is from US and husband was Moroccan, they moved back to Marrakesh after some years in US with their kids. Her husband knows all the best places to eat in Marrakesh since he grew up there. They would see tourists go into certain restaurants and feel sorry for them because they know that those visitors probably read some review online about how great such restaurant was. But they would not truly get a local flavor. They knew that some tourists were also afraid the venture off “tourist paths”. They also knew that some of the best local foods would not be mention on popular restaurant review websites, such as tripadvisor. Ok, I realized I just wrote an essay, but my point is. YOU SHOULD DO A FOOD TOUR! Awesome to hear from you and so glad that you and your boyfriend are coming to Thailand for your birthdays – and also very cool that you both love to eat and experience authentic local culture. Have you heard of Plate Culture? https://plateculture.com/ I haven’t really used it myself, but I know it’s a place to find a home-cooked style meal. I appreciate you sharing about the Morocco story, that is so true. I have thought about giving food tours, but at the moment, because I travel so much, I’m always in and out of Bangkok. But perhaps in the future. Hope you have an amazing trip to Thailand and I know you’ll enjoy the food! 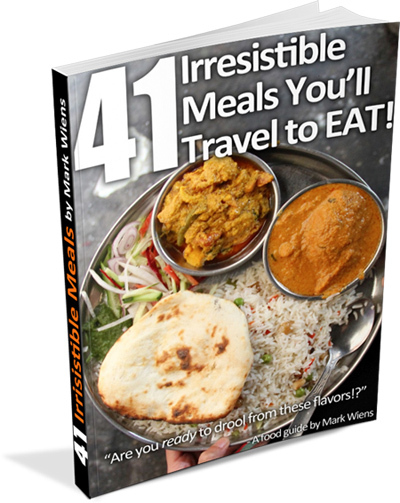 Hello Mark, I really love looking at all your food adventures! Looks really yummy. I was checking Google Maps though, it seems Soei is permanently closed! Do you know where they moved to? Hey Jocelyn, thanks for letting me know, I’ve just updated the info in the article. hi Mark, am going to make a stop in Bangkok next time in the area just to try out this restaurant! Hey Rara, awesome to hear that, it’s well worth eating here! Hey Valerio, great to hear from you, glad you love Thai food as well. Thank you for the restaurant recommendation, ok will definitely try to check that out. Thanks! Thanks for putting up such useful information. i would like to see something like Bangkok guide for Malaysia. Hi Syed, you’re welcome, thank you for reading! Thank you Mark, for giving so much expressions for where to go in Krung Thep. May wife and i will surely go to Soeis next time in octobre, before we will visit Mae and Por in Uthai Tani. At least we will meet anywhere the flavour is???? Hi Herbert, you’re welcome, thank you for your support. Glad you’ll be coming to Bangkok in a few months! Mark, if you google soei 6 you’ll find soi 6, and there’s a place they use your descriptio of the best duck you ate as their menu. It’s ok, but for sure not Soei! Hi Karin, thank you for letting me know, appreciate it. Question for you Mark: Soei will be closed in December while i’ll be in Bangkok, I totally love the pictures you posted… is there any other place like it that you would recommend? Thanks for your amazing job! Wish i had scrolled to bottom to check for open and close times…. flew in from Korea and convinced my wife that this place a must try from your vblogs and Andrew Zim’s comment about the dishes being the best of its kind he had ever had…. its now Saturday 2:47 pm and we are in a cab heading to khaosan…feeling hot, hungry, and dissapointed…..
Hi Mark! I just want to thank you for providing such a wonderful resource. We just the week in Bangkok and your site totally drove, inspired, helped us in a pinch, informed us, and guided us the whole time in a truly invaluable way. Just so wonderful and I have so much thanks. Thank you!!!! Hey Ben, you’re welcome, I’m happy to hear it was helpful. Glad you enjoyed the food! After watching your videos for a couple of years, I’ve finally come down to Bangkok, and my-go-to was Soi. I was not disappointed at all. Absolutely amazing flavors and prices. Walked from victory; I was worried if a 30 min walk was worth it, but my doubts were cleared after the first bite. And I salute you. 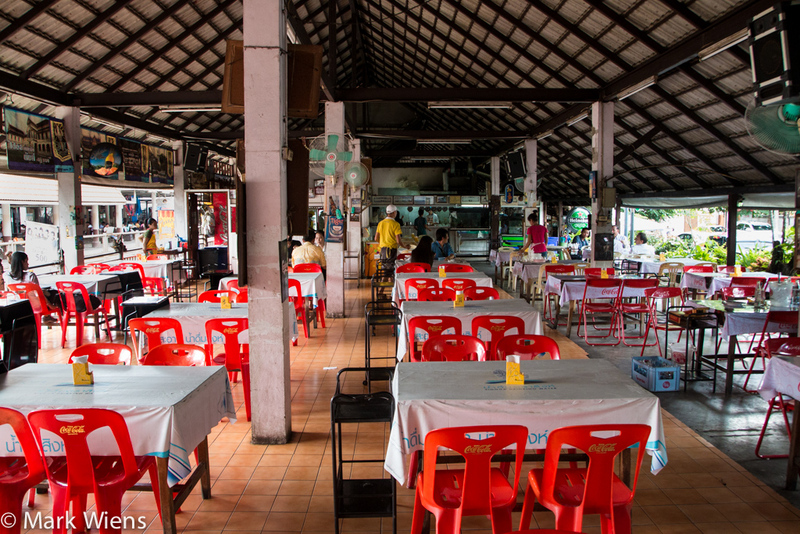 It is a totally different restaurant from anything in Thailand. P’soei is a master. Hey Julian, so awesome to hear you made it to Seoi, glad you enjoyed it! 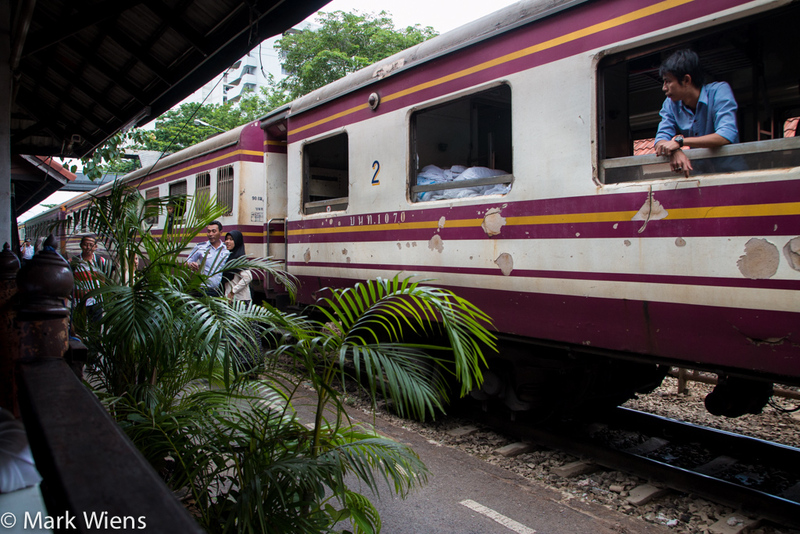 Another easy option is to catch a train from hualumphong station straight to samsen. Its a 12 minute ride. Thanks Mark for the recommendation! The food looks really good n we are flying into Bangkok this weekend n this is a must go for us! I thought that it would be great if Soei can share something like an online menu. Can’t wait to try all the dishes u shared on your youtube videos! Keep up the good work! ???????? Hey Alex, great to hear you’ll be coming to Bangkok. Have a great trip and enjoy Soei! Omg! We just had lunch at Soei, and everyone was impressed by the wonderful flavors that came out of that kitchen! Thanks again Mark for recommending this amazing restaurant n I’m pretty sure we will be going back soon! ???????????????????????? Hey Alex, awesome to hear that, glad you enjoyed Soei! Arrived in Bangkok a day ago. 1st night was Roti Mataba near Soi Rambuttri; a great choice so thanks for the recommendation. After watching your videos of Soei though this had to be this year’s pilgrimage. Some of the finest Thai food I’ve ever had ! The Boo Neem Pad Pongarri (soft shell crab) was simply amazing. Chu Chee Pla Too (mackerel) was delicious too. But….. how does P’Soei make two fried eggs taste so good ??? I can only say that the Yam Kai Dao left us looking for the food superlatives book ‘special reserved chapter’. Quite simply stunning for something so simple ! Thanks again Mark for your videos, website and e-book; off to find Som Tam Sida at Wang Lang Market for lunch; can’t wait – woke up at 5am thinking about it ! Hey Andy, thank you very much, hahah I feel the same way about the food at Soei, it’s unbelievably good. Glad you enjoyed it too! Hey Ronan, yes they do also have some beef and pork on the menu. Another winner Mark. Just had an early dinner there tonight and it was absolutely delicious. I especially enjoyed the Yam kai dao. Looking forward to more of your recommendations throughout Thailand and the rest of Southeast Asia. Hey Rhory, great to hear you enjoyed Soei. That fried egg salad is one of my favorite dishes as well! I have noticed a typo, shouldn’t it be ต้มยำปลาทู? We took quite a few of your suggestions on Bangkok and Vietnam for our honeymoon!! Thank you so much for making so many great recommendations! Our favorite was Soei! We went 2x!! We also loved the Chatrium. Hey Emily and Zac, great to hear that, congratulations! Glad you enjoyed the food! Hi Mark! I will be visiting Bangkok in a couple days. I hope I get to eat at Soei, looks delish. Do any of the employees at this restaurant speak English? Hey Monica, good to hear you’re going to go to Soei, just keep in mind the dates when they are closed for New Years. I don’t think the staff speak English, but they do have a print-out of this blog post for the menu in English! Enjoy! Hey Gareth, good to hear from you. Hope you enjoy Soei! Thank you for sharing I really like your style, keep posting and update. it’s on my list for the next trip. You’re welcome, thank you for reading Yopi! Thanks Mark. I am a fan of your food odyssey. Love your sense of food and genuine appreciation of each and all dishes you encounter. Hope to visit Soei and other restaurants you recommend. Hey JN, nice to hear from you, thank you for the kind words. Yah, if you enjoy spicy and strong flavored Thai food, you’re going to love Soei. Will you be traveling in Thailand soon? I will definitely try it out. Thank you. Mark, If visa is not accepted at Soei, then will they accept dollars? Also, can you recommend another great restaurant for me to go to on my first Saturday passing through? I was trying to avoid traveling way down into BKK because I am staying at a hotel right at the airport. I am willing to travel for Soei, but if you can recommend another place that is open on Saturdays (lunch or dinner) that is closer to the airport or relatively so, let me know! Mark, I hope you get this message. Not sure if you look at the posts for this anymore. I am sad to say I will be in BKK on a Saturday passing thru to Bhutan. The restaurant is closed then. However on my return I can make if for dinner on a Sunday, Oct 25. Are Sunday dinners busy as well? Or is it just Friday nights that are busy. If so, what time should I arrive in order not to have to wait 2 -3 hours for dinner? Also, do they take visa? Thanks for your reply! Hi Catherine, good to hear from you. I’m not really sure, but most local restaurants accept cash only. But you should be able to get to an ATM or money exchange right at the airport. Sunday dinner should be alright, if you can arrive sometime in the mid-afternoon that’s the best time to get in, but you can try to go in the evening, I think it would be alright. Hope you have a great trip! Hey Mark, Thanks for the info! It appears that you missed one of my questions. Let me try again. Since I will be there on a Saturday outbound, I cannot to to Soei that night. I was looking for another good restaurant that isn’t closed on Saturdays like Soei is. Based on your reviews, Gai Yang Klang Bueng seems like a good choice that isn’t so far from my airport hotel as others that are further downtown. Is this a good choice? Or do you recommend another place. Again, I am TRYING to avoid an hour drive into downtown just to eat. Seems like this place is about a 30-40 minute drive from the airport. Thoughts? Hi Catherine, sorry for missing this question. 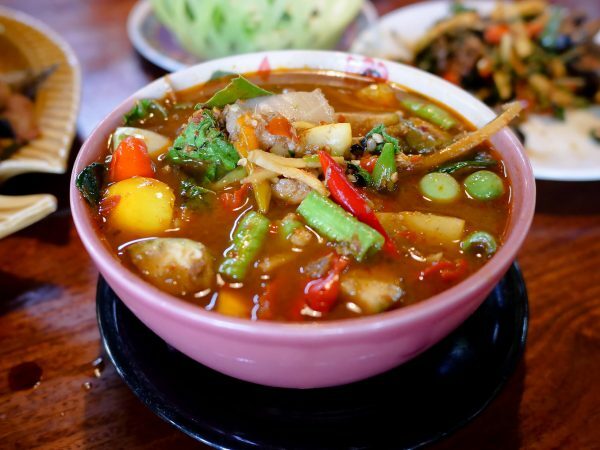 Yes, Gai Yang Klang Bueng https://www.eatingthaifood.com/2014/07/gai-yang-klang-bung/ would be a good choice in the Bang Na area, and you could also try Kao Suan Kuang in Bang Na: https://www.eatingthaifood.com/2011/08/bangin-som-tam-at-central-bang-nas-relaxing-isaan-food-retreat/ All the best! Amazing amazing!!!! Love all your reviews as you know! You are awesome. Love this place and the foods. I cannot wait to go back to Thailand!!!!! Missing it so much. This review was awesome!!!!!!! Hey David, thank you very much, really appreciate your support. Glad you love the food at Soei too! Mark, I just had lunch here based on your video. Stop. Really? It was SICK (meaning GREAT). I had the Kaem Pla Too To D (Mackerel Heads) and the Pla Goong Pao. Also 2 Singha beers. Best meal I think I have had in years. The flavors were indescribable and what was cool is even after the 2 beers I left feeling, well, not overly stuffed, although the portions were huge. As you called it the owner was running the kitchen. Thanks again, as always, for the videos as they have made my travels even better!!!! Haha, thanks Paul, glad you loved Soei. 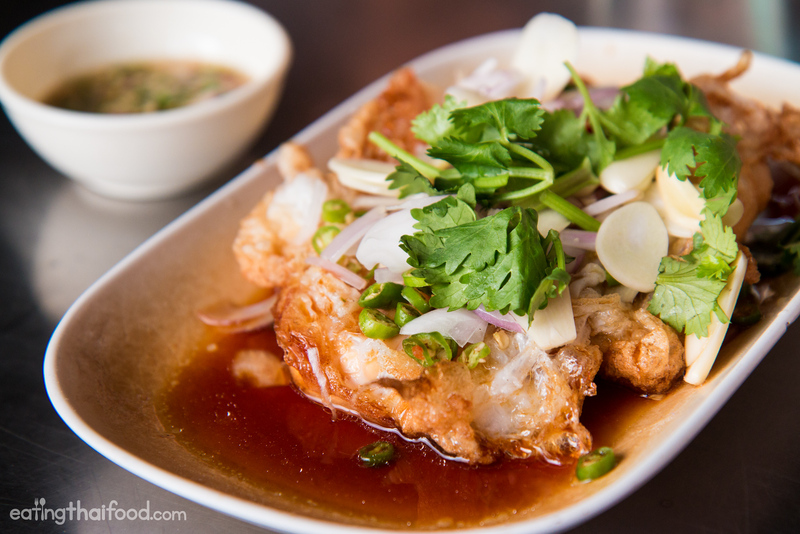 It’s truly one of the best restaurants in Bangkok with some of the most pronounced flavors. Glad you loved it. Hi Mark, I am visiting Bangkok in June and this restaurant is definitely in the list of my to-visit-restaurant when I am in Bangkok. As I am reading through the comments, I realize that it is quite difficult for a non-thai-speaking person like me to order food when I am at the restaurant. Could you possibly provide a guide as to how to order from this restaurant or do a simple translation for the menu as I would wish to sample more variety of the food that this restaurant cooks up other than the five that you have eaten. Soei is a true experience. The location, the trains, the food, everything stands apart. Only 5 dishes on the menu, but that’s probably their best since all had been tasted by you Mark :) Came at the middle of the afternoon so very few people in the restaurant, and no waiting time. I was alone, so I took only two, the fried mackerel heads and the Pla goong pao. Both terrific, but even more the Pla goong pao. Amazing flavours, and the shrimps are hugge! I went their by boat then bus, not too difficult, but I speak a bit Thaï. Again great recommendation from Mark! Yes, glad you enjoyed it Arnaud, it’s still one of my favorite restaurants in Bangkok! Thank you Arnaud, hope you enjoyed it! Went tonight after another immigration drag. I would urge that anyone reading this to definitely go with a Thai speaker as the owner (presumably) actually has had five dishes you wrote about here typed out on a laminated A4 card (one-side) with your English phonetics of the Thai dish names and descriptions, while the Thai menu goes on for at least eight or more pages. I also felt we were somewhat banished and shown to the Farang Corner with gaps of at least one table between us and other diners who were clustered together though not in an intentionally offensive way. My reading is nowhere enough to read a menu so we were stuck with the English menu and casting longing looks at the other tables. I did think of walking around to point at dishes that weren’t on the English menu but by that point we felt we had the mark of death on us already. The ‘ceviche’ with wasabi was an interesting note but I personally thought the wasabi was on the overkill side. A dab is all that is required to bring out the taste of the prawn. Liked the mackeral curry – nicely done.Went tonight after another immigration drag. The setting is atmospheric at night. I liked the trains going by. Would have liked a more extensive menu (in English) even more. The smells from the kitchen smelled divine. Hey Tara, good to hear you went to Soei, and hope all is well with immigration. Yah, it is a good place to go with a Thai speaker (reader) as the menu is quite extensive and they have some very unique dishes on their menu. The flavors are definitely strong and well pronounced. Thank you for sharing your experience. Our first trip to Thailand – and after watching your Video about this place we decided to give it a try. We were a little surprised that there was no english menu but with a little help from the restaurant owner (the only one who spoke english) we managed to make our order. It was incredible! I couldn’t believe that food can taste like this! Since the restaurant is a little far away from crowded places it was difficult for us to get back to the hotel. We had to walk a while until we could catch a cab. We will definitely go there again when we are back in Bangkok! Unbelievable fantastic food! Thank you for this absolut “secret insider” tip. Hey Alex, very cool to hear that, thanks for sharing, and glad you loved Soei! I’ve just finished reading your entire Migrationology blog and am now working my way through this one (not gotten very far yet obviously). Your posts never fail to get my stomach rumbling but I’ve got to say that the food here seems right up my alley, what’s not to love about sour and spicy? 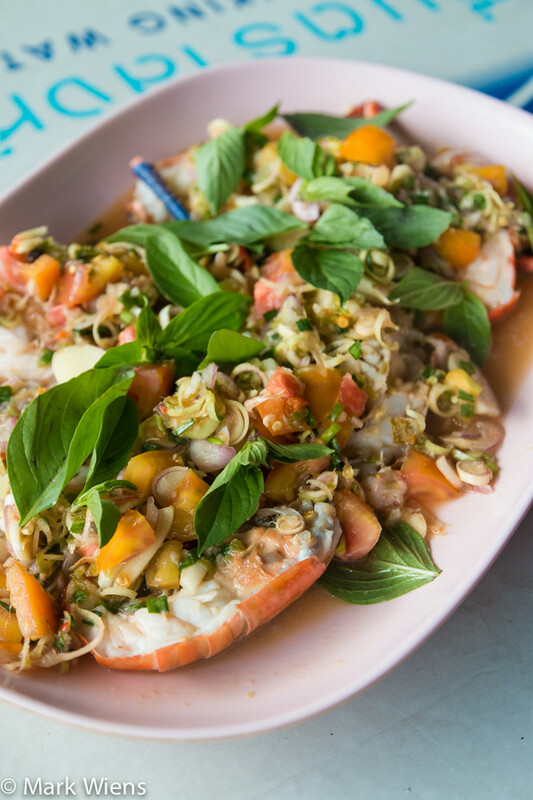 That Thai Shrimp Salad…….. looks like heaven. I’ve never been to Thailand but have been doing a bit of research (mostly on food to be honest) and hope to get there some time next year. I’ll be in Penang over the new year to tide me over for a bit though. Keep up the good work. Hey Kenny, thank you very much, I appreciate it. Hope you can visit Thailand next year, and definitely this is a restaurant you’re going to love. Thanks again for reading. great vid, mark – as usual! even though i just finished eating (and am a strict vegetarian), watching that made me sooo hungry. i will soon be slowly working my way back to thailand from saigon and am looking forward to trying your suggestions. nice camera work too; your wife is getting really good at it! Hi Terry, thank you for watching. Hope you’re doing well. I always love your food photos, Mark! Do you have any quick tips for taking great food photos? Thank you very much Ashley. As for food photos, I think the most important thing is good light – so I normally try to eat my best meals at lunch or early dinner when there’s good natural light. Then I think just focus on a part of the food, take lots of photos, and try to show different angles of the dish. Hope this helps. Mark, thanks for feeding us with unbelievably good food. Soei seems a ‘must-try’! Hey Gem, you’re welcome, thank you for following. Haha, loving the acronym GCNP! What a combo, haha yes, one of the great combos for sure. Hope you’re having a great day. How hard is it to order there if you don’t speak Thai? Hi Kathy, I didn’t see an English menu, but as long as you know what you want to order (maybe some of the same dishes in this article? ), then I think you shouldn’t have a problem. I’ve heard a lot of good things about ร้านเส่ย. I have to really put it on my wish list for the next trip. Thanks for the recommendation. Thank you Songtham, hope you can eat there on your next trip. I am going to Bangkok next month and will try the Soei. Thank you for finding these hidden gems. Hi Anil, good to hear that, hope you enjoy it. First, I thought that it would be around 150-200 THB per dish. But when I see the price, there is only one high price dish which is half the total bill. So I think the price is somewhat reasonable plus the quality make up for the price you are going to pay. I have seen the menu (thank for the internet and the one who take photos), there are many menus to have not just shrimp, fish, squid. There are frog, crab, beef, pork. They even have beer. I think เนื้อน่องลายผัดกระเพรา , กุ้งตระกาด and ข้าวผัดปลาทู must be very good too. Hi Kitti, yah that’s true, the pla goong was by far the most expensive, so it made the whole bill more. I thought it was very reasonable as well, because the quality of the ingredients is very good. Yes, those dishes sound delicious too, I can’t wait to go back and eat there again. Let me know once you eat there. Hi Ron, huge thank you for getting a copy of the Eating Thai Food Guide. Hope you have a wonderful time on your next visit to Thailand. Let me know if you have any questions about food. Nice review! I have noticed that place on numerous occasions. Now I have good reason to try it out! Hey Ko, great to hear that, you’ve got to try this place. Hey Mike, thank you very much. Hey Curt, thanks, yah this was one of those meals where I almost fell out of my chair it was so good. I love that original style of goong chae nam pla as well, will try to feature one soon. Thanks! I absolutely love your passion for food Mark. 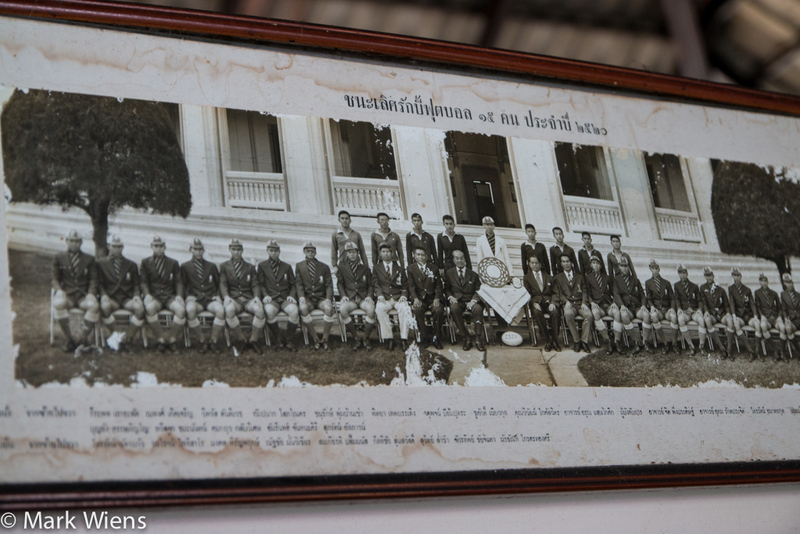 Thanks for sharing with us mate – and this is on the list for a Songkran visit next April. Thank you very much Steve, and great to hear you’ll be visiting again next year for Songkran.